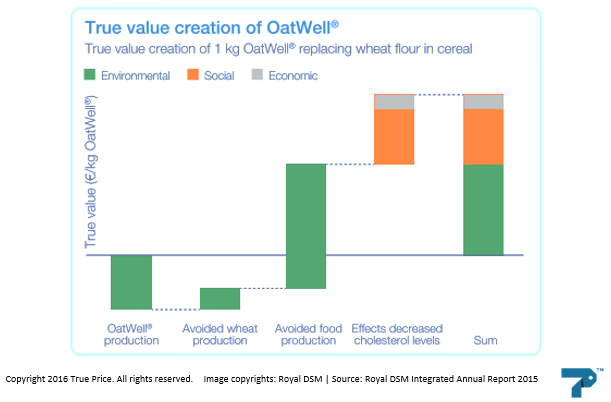 Results show that the positive environmental and social effects are substantially higher than the environmental costs associated with OatWell®’s value chain. Producing OatWell® incurs environmental costs, mainly in water, energy and land use. A part of that costs is compensated because OatWell® replaces wheat that no longer has to be produced. Further significant environmental benefits are expected as a result of reduced food production, since research suggests that people eat considerably less when OatWell® is part of a healthy diet. The final effect is the expected social and economic benefit of reduced cardiovascular diseases, a specific health benefit of OatWell®. Description: In collaboration with Royal DSM we carried out a pilot study on OatWell®. Together we quantified the environmental costs and benefits associated with OatWell®, by assessing its impact on natural and social capital and assigning an economic value to the environmental and social impacts across the value chain for specific product and market applications. This comprehensible presentation of combined environmental and social impacts allow comparison with economic costs, and encourages thinking about business models that capture societal value.